Location: Nithsdale, Dumfries and Galloway, Scotland. 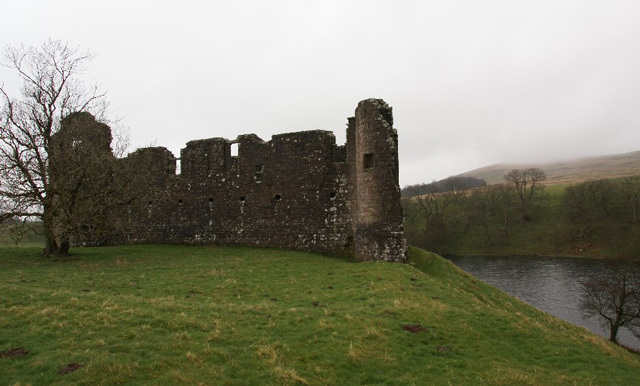 Notes: Morton Castle is located by an artificial loch in the hills above Nithsdale, in Dumfries and Galloway, south-west Scotland. It lies 2.5 miles north-east of Thornhill, and once formed part of a chain of castles along the strategically important Nith Valley, which runs from the Solway Firth north to the Clyde Valley.Architecturally the castle bears some resemblance to Caerlaverock Castle, being triangular in plan, with similar twin gatehouses at the south-west corner. One of the two D-plan towers still stands to four storeys, and has a pit prison below. Above this were several rooms which probably served as the lord's lodging, as suggested by an elaborate fireplace in one room. Only the foundation of the second gate tower remains. The gate originally had a portcullis, and a turning bridge over a pit. This high level of defensive architecture contrasts with the main range of buildings across the south of the castle. Here, large, fine arched windows and a lack of arrow loops suggest that this range was either built or remodelled as a hunting lodge. The long two-storey block had a large first-floor hall, with basement rooms below. At the east end, a private room opened off the hall, connecting to rooms in the round south-east tower. To the north, the walls which flanked the edges of the marshland have been removed, leaving the former courtyard open.